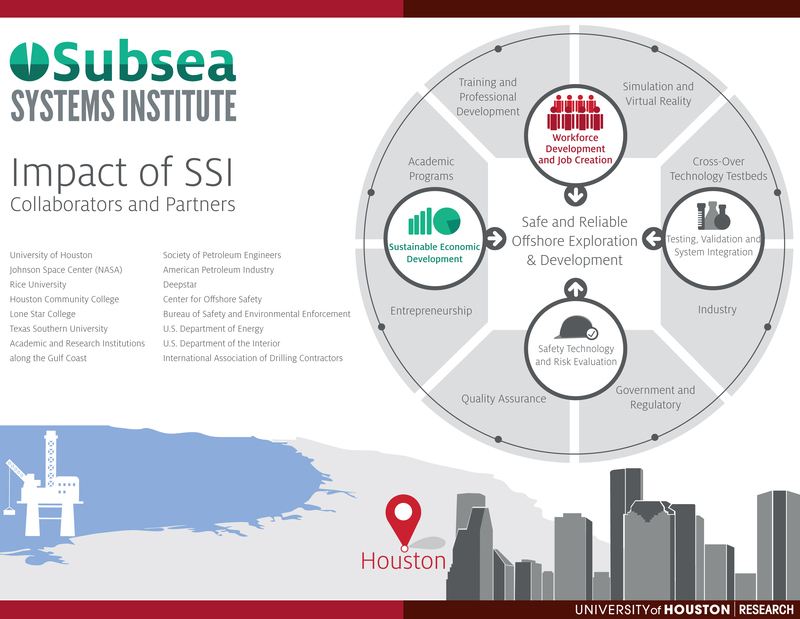 The Subsea Systems Institute (SSI) was established in 2015 as a Texas Center of Excellence under the RESTORE Act and collaboration between the University of Houston, Rice University and the Johnson Space Center (NASA). In addition, the SSI and the University of Houston has partnerships with the Lone Star Community College, Texas Southwest University, Houston Community College, and other colleges to lead research and develop training and educational programs to accelerate energy related workforce development in critical areas for the state of Texas. Attract and retain talent for jobs and investments in the local, state and national economy and to reinforce Houston and the state of Texas’s reputation as the Energy Capital of the World. As a result of the DeepWater Horizon incident, President Obama signed into law the Resources and Ecosystems Sustainability, Tourist Opportunities and Revived Economies of the Gulf Coast States Act, otherwise known as the RESTORE Act. The RESTORE Act established the Restoration Trust Fund, which allocated 2.5 percent of the money received in civil penalties for the creation of Centers of Excellence in the five Gulf Coast states to further Gulf coast science, monitoring and technology. Then-Governor Rick Perry and the Texas Commission on Environmental Quality (TCEQ) awarded the funds (about $4.1 million) for the Texas Center of Excellence to the consortium partners of the University of Houston, Rice University, and NASA Johnson Space Center. Dr. Krishnamoorti is the Chief Energy Officer at the University of Houston. Prior to his current position, Krishnamoorti served as Interim Vice President for Research and Technology Transfer for UH and the UH System. During his tenure at the university, he has served as chair of the UH Cullen College of Engineering’s chemical and biomolecular engineering department, associate dean of research for engineering, professor of chemical and biomolecular engineering with affiliated appointments as professor of petroleum engineering and professor of chemistry. Dr. Krishnamoorti obtained his bachelor’s degree in chemical engineering from the Indian Institute of Technology Madras and doctoral degree in chemical engineering from Princeton University in 1994. Dr. Kapusta is the interim director of the Rice Energy and Environment Initiative. Internationally acclaimed for technical accomplishments in oil and gas safety of operations, Dr. Kapusta worked at Shell in all areas of the oil and gas business and served as chief scientist of the Royal Dutch Shell group of companies. His responsibilities included advising the senior management of Shell on science and engineering topics that affect the industry, collaborating with academic and research institutions, and developing Shell’s strategic R&D plans. Dr. Kapusta is the author of over 70 technical papers. Dr. Lulla holds a PhD in Chemical Engineering and MBA from Rice University, where he currently teaches in the Engineering and Business Schools. Dr. Lulla is the director of the University Research, Collaboration and Partnership Office at Johnson Space Center. Internationally acclaimed for his research and scientific accomplishments in optical remote sensing technologies and Earth observation sciences, Dr. Lulla served as a chief scientist for Earth science payloads for shuttle and the International Space Station. His responsibilities included training shuttle astronauts in Earth imaging for more than 40 flights. Dr. Lulla is the author of over 200 scientific and technical papers and co-author and co-editor of the recent NASA book “Wings In Orbit.” Dr. Lulla holds two Ph.D. degrees in Earth and Space sciences.